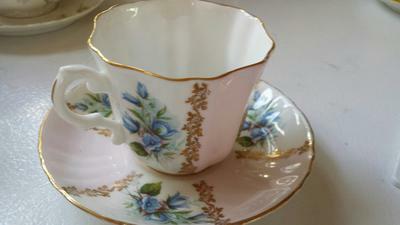 Since I was a poor young thing living independently I shopped at thrift stores for pretty pieces of china. My first "set" of china was one each of a dozen different complimentary patterns of fine china I was able to buy cheaply at these stores. When I first met my mother-in-law-to-be she had a very large teacup and saucer collection. That was good news - something in common. When my mother-in-law passed away I inherited several pieces. 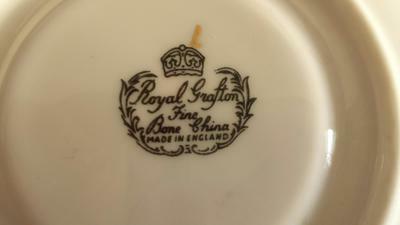 There were two Royal Albert pieces, one Havilland & Co. Limoges and this one piece of Royal Grafton. I was able to successfully identify 2 out of 4. The Royal Albert items were easily identified. The Havilland was/is very difficult because most patterns went unnamed and mine is so similar to dozens of others with sculpted plates and tiny pink roses. I may never find that. Someday when I pass these lovely items on to my daughter-in-law I hope to be able to give her some history to make them more meaningful to her. After searching this site, although I didn't find specific information, I am hopeful that someone can tell me about this cup and saucer. I was able to find that the numbers which appear to be hand painted in gold on the bottom of the cup represent pattern numbers. Searches of all the "replacement" websites I could find did not yield that pattern and general informational websites did not either. 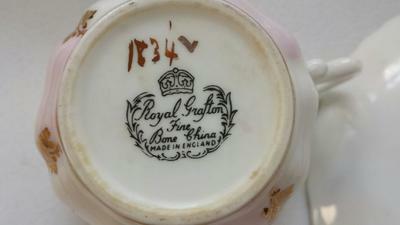 So now I am hoping that someone out there will know what 1834 L stands for on this Royal Grafton Fine Bone China teacup and saucer, if the pattern has a name and what year it might have been manufactured. I know that it had to be between late 1800s and 1972 but have hit an information void beyond that. After spending about 2 full days researching this I think it's time to ask for the reinforcements! Royal Grafton pattern numbers. Who worked there and knows? I can't really tell you more than you already know on this one. The 1834L is a production reference of some sort, not necessarily the pattern reference. It could be the shape or the pattern or a combination of the two. Not all patterns had names. I googled Grafton bone china patterns and found your exact pattern had been sold on Etsy and another colour version on eBay. No one knew the pattern name though. If you were to troll through the completed listing of ebay sales of Grafton bone china, you might get to look on the base of one of the other colourways (this one was green rather than pink) and see if it says the same number. If it were, say, 1834 G, it might mean the pattern number is 1834 and the colour is the letter. Only guessing. We do have contributors who used to work at Royal Grafton, so it they see this post, maybe they can let us know.